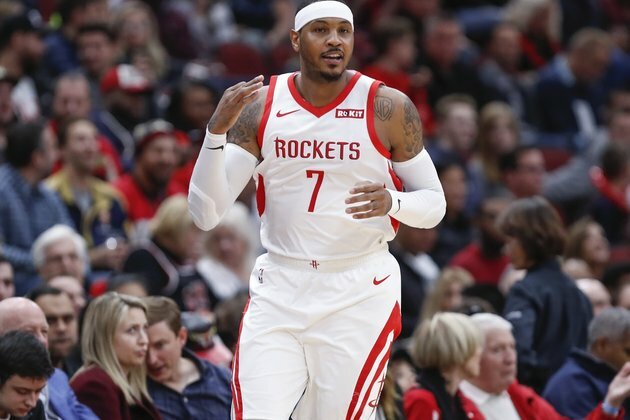 Carmelo Anthony laughed a year ago when he was asked about the possibility of coming off the bench for his new team, the Oklahoma City Thunder. Through nine games this season — seven off the bench — Anthony is averaging 14.7 points and shooting 36.2 percent from behind the 3-point line. That’s a slight improvement from his outside shooting performance for the Thunder. Oklahoma City is hoping Russell Westbrook will be ready to go against the Rockets. Westbrook missed Wednesday’s first game of the back-to-back with a sprained ankle suffered late in Monday’s win over New Orleans. In Westbrook’s absence, point guard Dennis Schroder — who was the main piece of the Thunder’s return in the Anthony trade to Atlanta — scored a season-high 28 points in Wednesday’s win. While things didn’t go well for Anthony in Oklahoma City, he’s looking forward to making his return.